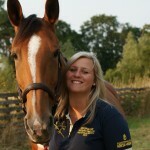 Hi, I’m Laura Goodall, a 24 year-old, Grade 4 Para Equestrian. Four years ago, I was diagnosed with multiple sclerosis, a neurological condition which affects your central nervous system, brain and spinal cord. Since my diagnosis, I have fought a difficult battle with my health and have struggled to pursue my aspirations for equestrian sport and continue with my love for riding horses. In the last year, I have been doing everything possible to improve my health and get fit enough to be able to compete and pursue my dreams and this is now starting to pay off. I approached Shrewsbury Family Chiropractic back in August this year with numerous issues and have never looked back since! Glenn has worked his magic and transformed my day to day life. My overall health has improved massively since starting chiropractic care – not only has my back pain almost gone, but my strength and balance have improved and I suffer with fatigue far less. Due to this, I have also been able to up my physical activity massively and this has also contributed to a benefit in my overall health. Being a keen equestrian with a health issue affecting my balance means falls and bumps along the way are unfortunately part and parcel of the sport. However, Glenn has been amazing at helping me with my injuries during my adjustments and helping speed up the recovery process, meaning I can get back in the saddle as quickly as possible, which is a massive benefit to my training schedules! Due to my adjustments keeping me in good physical shape, I can approach my competitions with the British Show Jumping Para Team with confidence, something that twelve months ago I thought I would never be able to do. I also feel I am in the best hands to keep my body and health in the best condition possible and for this I will be forever grateful. I really would recommend anyone with or without physical issues to use a chiropractor on a regular basis, as the benefits are invaluable for keeping your body and health in prime condition.